Your plastic surgeon will also discuss where your procedure will be performed. Rhinoplasty may be performed in an accredited office-based surgical facility, a licensed ambulatory surgical center or a hospital. Be sure to arrange for someone to drive you to and from surgery and to stay with you for at least the first night following surgery. 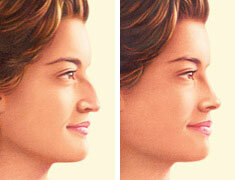 What are the steps of a rhinoplasty procedure? What words should I know about rhinoplasty? Connective tissue that forms the structure of the nose. The narrow strip of tissue that separates the nostrils. Cartilage that separates the nostrils is misaligned which may cause partial nasal airway obstruction. Surgery to reshape the nose.